For many of us the warm days of summer, sitting on a beach or possibly being in a different country are but a distant memory. Whether we have been on holiday in the UK or abroad the chances are that we has seen and may even have bought a souvenir t-shirt from where we have been. Have you ever wondered about how these t-shirts can be created? As part of her Level 2 studies, Mireia understood research on an artist and originally coming from Barcelona, Antoni Gaudi was a perfect choice. 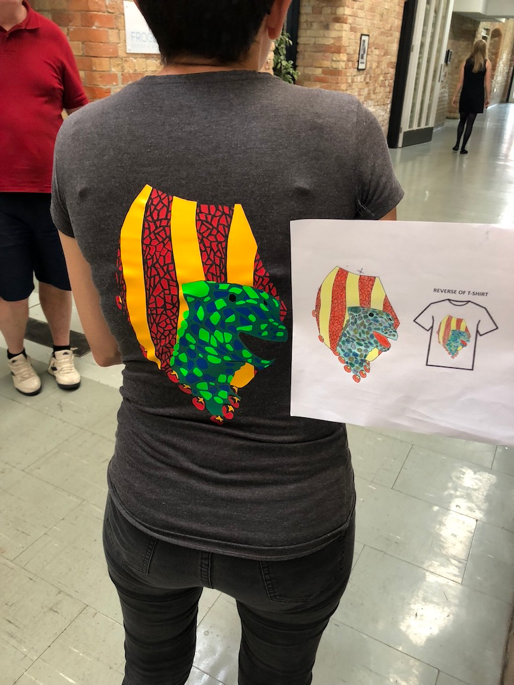 Mireia drew inspiration from the work of Gaudi using mosaic tiles in some of his work to sketch her own t-shirt design that incorporated the famous dragon from Parque Guell in Barcelona and also the Catalonia flag. Mireia transferred her hand drawn image onto a computer and using specialist software undertook the painstaking task of plotting the cut lines of 6 different coloured vinyls which would be used on her t-shirt design. Each layer was then cut out on our vinyl cutting machine before being heat pressed to the t-shirt. In the photo below you can see firstly the 6 vinyl layers followed by each layer gradually being applied as the t-shirt evolved. We had to do a comparison from concept to reality and in the photo below you can see Mireia’s original sketches held next to the t-shirt she created and I’m sure you will agree what an incredible job she made of it! We let Mireia take her t-shirt to Majorca to show off on a family holiday. Whilst Mireia herself was proud with what she had created, even she did not expect to be stopped in the streets to be asked where did she buy the t-shirt or where could people get one? T-shirt design is just one of a wide variety of skills you can develop on our Level 2 Art, Design & Creative Studies course. We can guarantee you will end up with a unique and wonderful product that will be the envy of your friends and family… who knows it could even be the start of a whole new career! Get in contact with us if you would like to find out more.